A good read, well written and supported by many documented facts. I would recommend this to all history buffs and for those that can take other points of view into consideration without throwing the baby out with the bath water. Can we ever know the true facts after all the cover-ups and disinformation? In this Cold War CSI thriller, Robert K. Wilcox argues that General George S. Patton Jr. did not succumb to injuries suffered in an unfortunate fender-bender accident, in December 1945, but was instead murdered. The author goes on to claim the hit was a joint OSS (Office of Strategic Services-forerunner to the CIA)/ Soviet NKVD plot orchestrated between William J. "Wild Bill" Donovan and Joseph Stalin's secret spy organization. The author holds that Patton, who had created strong enemies among the highest levels of American, British, and Soviet political and military hierarchy, was bitter, if not somewhat mentally unbalanced, due to retire and write a tell-all book. He needed to be silenced. According to Wilcox, the murder was a complex conspiracy that involved, among others: the driver of the truck that veered in the path of Patton's Cadillac staff limo, a well placed assassin firing a rock from a specially designed Czechoslovakian air rifle through a four inch opening in the back window (recall the movie "Brass Target"), striking Patton, to MPs on the scene, medical personnel at the hospital, and the list goes on and on. When the so-called accident failed to kill Patton, Wilcox suggests the possibilities that Patton was bludgeoned inside the military ambulance en route to the Hospital (causing his serious scalp wound), and finally, a co-conspirator disguised as a hospital attendant slipping a cyanide solution through his intravenous tube triggering the embolism the eventually caused his death twelve days later (a favorite Soviet assassination method, as Wilcox reveals). Presenting such an extraordinary case is one thing, convincing his readers is quite another. Wilcox's star witness is an ex-OSS agent who claims (as early as 1979) that he received the mission to assassinate Patton directly from Donovan. Since this agent admired Patton, he passed it off to an accomplice. The only trouble is, anyone who could either contest or verify his story is already dead (a fact that Wilcox readily admits to). A second witness, a former Counter-Intelligence Corps (CIC) agent who infiltrated the NKVD warned Donovan that Patton was on Stalin's hit list, unaware of Donovan's involvement. Wilcox enjoys adding an element of cloak & dagger to his trek by stating that his OSS witness's multi-volume diary has been copied and dispersed to trusted friends for safe-keeping. This die-hard Cold-Warriorism seeps through Wilcox's story in a few places. He also tends to dramatize a discovery by stating: "A formally Top Secret document I found at the National Archives...." Anyone who has ever conducted research at the National Archives will smile as 99.9% of all documents housed there were at one time classified as "Top Secret." The author's notes are extensive, if somewhat sloppy, in places. One example states confusingly, "hospital records," without clearly citing what records, where were they located, who comprised them, etc. In true CSI fashion, Wilcox takes his readers along with him as he retraces the events leading to Patton's death. This is a smart tactic, and one that holds the reader's interest. Hurdles abound: from missing accident reports, numerous conflicting eye-witness testimonies, Wilcox seems to run into one dead end after another. The author is up-front and admits openly when a research path has become exhausted, but at the same time, it seems obvious that some ellipsis sprinkled statements; especially those from clueless relatives of long-dead participants are taken out of context to support his argument. Although Wilcox lists secondary sources published by Patton family members, there is no suggestion that he has support from the family. He does get the nod from Charles Province, Patton scholar and keeper of the George S. Patton Jr. Society web site, however. The author seems to have a fixation with automobiles, methodically concluding, that the Cadillac limo housed at the Patton Museum at Fort Knox in not THE car that Patton was riding in at the time of his accident (as claimed), to a needless tangent investigating what ever happened to Hermann Goering's limo, (the Russians have it) a vehicle that had nothing to do with Patton's death. This reviewer dove into this book with skeptical red flags flying (no Cold War pun intended). Admittedly, Wilcox's presentation is well written and holds the readers' interest. This is especially true when the author takes the reader off on many lengthy tangents and digressions suggesting: Donovan allowed hundreds of Soviet spies to operate within the United States during the war; the Soviet Union not only co-operated with the Allies in an effort to defeat Nazi Germany, but actually influenced favorable post-war policy from within the United States. Written looking through Cold War lenses, Wilcox argues, for example, that a great opportunity was missed when a Nazi spy ring in the Balkans offered its services to the US to spy on the Soviet Union, but was declined by Donovan. Informed readers will quickly note that help from former Nazis in any capacity was against official policy, something Patton was rebuked for in post-war Bavaria, and risks facing Wilcox with an interesting contradiction. While at risk of losing readers in these far flung digressions, the author's writing skills instead maintains interest, and makes for the book's strongest asset. Although the case arguing the Patton was murdered is not new, Wilcox tries to get a lot of mileage revamping it. The questions he raises range from the etude and thought provoking, to the ridiculous. In his final argument, Wilcox admits the truth may never be known, but that a "strong case" exists that Patton was murdered. This reader isn't buying it, and Wilcox's case is admittedly strong in places while exceedingly weak in others. His book attests to the fact, however, that no matter how controversial a theory is, a well written argument strengthens its foundation. Wilcox's ability to spin a good yarn and hold the readers' interest warrants a four-star rating. Author Robert K. Wilcox has produced another well written work of non-fiction. 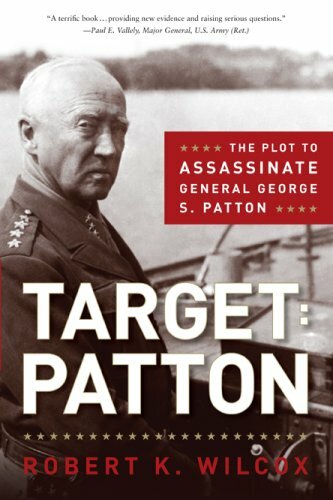 Having read many books on WWII and on Patton in particular, the title Target: Patton immediately caught my eye. I was familiar with Patton's military exploits (primarily through the movie starring George C. Scott), and have always considered it odd and ironic that one of the 20th century's greatest military heroes died not on the battlefield, but in a hospital as the result of a car accident. However, I was unaware of the theory that General Patton had been MURDERED. This was quite shocking and the more I read Target: Patton, the more disturbed I became. I grew up believing (perhaps naively) that WWII was a fight between the "good guys" and the "bad guys;" now it seems quite likely that not all of the "good guys" wore white hats. General Patton correctly foresaw the horrors of losing much of Eastern Europe and the folly of the 50-yr. Cold War, and may have been assassinated as a result of his opinions! Unbelievable? Madness? Read the book and decide for yourself. I came away convinced that not only was it possible that Patton was murdered, it is highly probable. In addition, the book puts the politicians like FDR and Eisenhower in a whole new, nefarious light. The death of General Patton has always seemed a bit too convenient in the way it strangely ended a lot of problems for a lot of people. I am not a conspiracy oriented guy, especially when the conspiracy involves more than a very few people a more than one of them is left alive once it is executed. They have a real tendency to break down in the real world. So, I don't buy into the idea that Patton was killed by the explicit and tacit cooperation of Stalin, the Soviet secret police, Wild Bill Donovan and his OSS, paid killers, Nazi civilians in American uniforms, Winston Churchill and Montgomery, and who knows who else. Yet, this is what this book asks you to believe. This is why I gave it three stars and that is because I did get some good information about the when and how Patton aggravated those who wanted to treat the Soviets as genuine allies and accommodate their wishes, of Patton's accident, the official explanation of his hospitalization and death. This is an entertaining read and if you believe in that Patton was murdered, then I would advise you to revise my rating to four or five stars. But I can't buy into the fact that the car in the Patton museum isn't the genuine car in the accident as evidence of a conspiracy. I see it as a desire to put on a show to draw crowds. On pages 358-360 the author recounts an attempt on John Wayne's life by assassins sent by Stalin - as told by a friend of John Wayne who recounts the story Wayne told him. No other evidence is provided. So, even if we accept the story as given, this conclusion is still a leap to the moon: "If Stalin targeted John Wayne, why not George Patton?" Hoo, boy. One of the central characters in this supposed murder is a fellow named Douglass Bazata. Apparently he was a special agent and an expert marksman. But he is supposed to have 1) used a specialized weapon that fired actual rocks rather than bullets, 2) jimmied the generals car window to stay open, 3) used the accident as an opportunity to fire the weapon at Patton, striking him in the face and breaking his neck. Uh, huh. The author tries to undermine the idea that Patton broke his neck hitting the roof of the car by saying that his body would have been thrown forward not up. This betrays a profound ignorance of the strange things that happen to human bodies inside cars during accidents. In the end, like all conspiracy theories, this book combines rumors and raises questions that seem together to raise weighty doubts of the official story. But when I examine them and think about their implications I, for one, see them more as mutually exclusive and casting doubt on the idea of Patton's murder. If every missing bit of government paperwork was lost for nefarious reasons, we are all in real trouble. And I do not believe that hundreds and thousands of people can work through a conspiracy and leave no hard evidence. I am not talking about leaving who did it in doubt (think about the murder of Gerald Bull), but evidence that a murder took place. If you are interested in this subject, go ahead and enjoy the book. In the end, I found it wanting. And no, I am not part of any conspiracy to keep the murder of Patton hushed up. But then again, if I were, wouldn't I say that anyway? I have read several of the books and the Lt. Oliver North, (ret) documentary about gen. George S. Patton, Jr. and this is the most comprestive and detailed book I have read concering his "accident". Being 70 years old I can remember my parents and uncles that served in WWII that thought general Patton was assassinated though several of them attributed it to disgruntled soldiers getting retribution about the slapping incident of the shell shocked soldier as it was called long ago. I would recommend the book to any student of WWII military history and particularly probably the greatest general of the allied forces during WWII.